A cerebral aneurysm occurs at a weak point in the wall of a blood vessel (artery) that supplies blood to the brain. Because of the flaw, the artery wall bulges outward and fills with blood. This bulge is called an aneurysm. An aneurysm can rupture, spilling blood into the surrounding body tissue. A ruptured cerebral aneurysm can cause permanent brain damage, disability, or death. A cerebral aneurysm can occur anywhere in the brain. 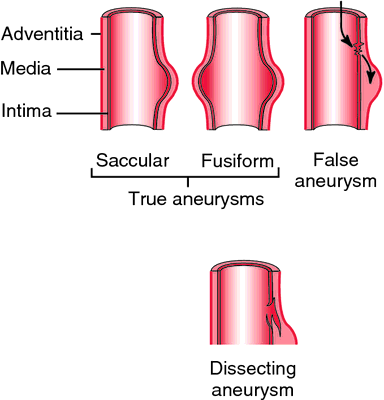 Aneurysms can have several shapes. The saccular aneurysm, once called a berry aneurysm, resembles a piece of fruit dangling from a branch. Saccular aneurysms are usually found at a branch in the blood vessel where they balloon out by a thin neck. Saccular cerebral aneurysms most often occur at the branch points of large arteries at the base of the brain. Aneurysms may also take the form of a bulge in one wall of the artery—a lateral aneurysm—or a widening of the entire artery—a fusiform aneurysm. The greatest danger of aneurysms is rupture. Approximately 50-75% of stricken people survive an aneurysmal rupture. A ruptured aneurysm spills blood into the brain or into the fluid-filled area that surrounds the brain tissue. Bleeding into this area, called the subarachnoid space, is referred to as subarachnoid hemorrhage (SAH). About 25,000 people suffer a SAH each year. It is estimated that people with unruptured aneurysm have an annual 1-2% risk of hemorrhage. Under age 40, more men experience SAH. After age 40, more women than men are affected. Most people who have suffered a SAH from a ruptured aneurysm did not know that the aneurysm even existed. Based on autopsy studies, medical researchers estimate that 1-5% of the population has some type of cerebral aneurysm. Aneurysms rarely occur in the very young or the very old; about 60% of aneurysms are diagnosed in people between ages 40 and 65. Some aneurysms may have a genetic link and run in families. The genetic link has not been completely proven and a pattern of inheritance has not been determined. Some studies seem to show that first-degree relatives of people who suffered aneurysmal SAH are more likely to have aneurysms themselves. These studies reported that such immediate family members were four times more likely to have aneurysms than the general population. Other studies do not confirm these findings. Better evidence links aneurysms to certain rare diseases of the connective tissue. These diseases include Marfan syndrome, pseudoxanthoma elasticum, Ehlers-Danlos syndrome, and fibromuscular dysplasia. Polycystic kidney disease is also associated with cerebral aneurysms. These diseases are also associated with an increased risk of aneurysmal rupture. Certain other conditions raise the risk of rupture, too. Most aneurysms that rupture are a half-inch or larger in diameter. Size is not the only factor, however, because smaller aneurysms also rupture. Cigarette smoking, excessive alcohol consumption, and recreational drug use (for example, use of cocaine) have been linked with an increased risk. The role, if any, of high blood pressure has not been determined. Some studies have implicated high blood pressure in aneurysm formation and rupture, but people with normal blood pressure also experience aneurysms and SAHs. High blood pressure may be a risk factor but not the most important one. Pregnancy, labor, and delivery also seem to increase the possibility that an aneurysm might rupture, but not all doctors agree. Physical exertion and use of oral contraceptives are not suspected causes for aneurysmal rupture. Cerebral aneurysms can be caused by brain trauma, infection, hardening of the arteries (athero-sclerosis), or abnormal rapid cell growth (neoplastic disease), but most seem to arise from a congenital, or developmental, defect. These congenital aneurysms occur more frequently in women. Whatever the cause may be, the inner wall of the blood vessel is abnormally thin and the pressure of the blood flow causes an aneurysm to form. Most aneurysms go unnoticed until they rupture. However, 10-15% of unruptured cerebral aneurysms are found because of their size or their location. Common warning signs include symptoms that affect only one eye, such as an enlarged pupil, a drooping eyelid, or pain above or behind the eye. Other symptoms are a localized headache, unsteady gait, a temporary problem with sight, double vision, or numbness in the face. Some aneurysms bleed occasionally without rupturing. Symptoms of such an aneurysm develop gradually. The symptoms include headache, nausea, vomiting, neck pain, black-outs, ringing in the ears, dizziness, or seeing spots. Eighty to ninety percent of aneurysms are not diagnosed until after they have ruptured. Rupture is not always a sudden event. Nearly 50% of patients who have aneurysmal SAHs also experience "the warning leak phenomenon." Persons with warning leak symptoms have sudden, atypical headaches that occur days or weeks before the actual rupture. These headaches are referred to as sentinel headaches. Nausea, vomiting, and dizziness may accompany sentinel headaches. Unfortunately, these symptoms can be confused with tension headaches or migraines, and treatment can be delayed until rupture occurs. When an aneurysm ruptures, most victims experience a sudden, extremely severe headache. This headache is typically described as the worst headache of the victim's life. Nausea and vomiting commonly accompany the headache. The person may experience a short loss of consciousness or prolonged coma. Other common signs of a SAH include a stiff neck, fever, and a sensitivity to light. About 25% of victims experience neurological problems linked to specific areas of the brain, swelling of the brain due to fluid accumulation (hydrocephalus), or seizure. Based on the clinical symptoms, a doctor will run several tests to confirm an aneurysm or an SAH. A computed tomography scan (CT) of the head is the initial procedure. A magnetic resonance imaging test (MRI) may be done instead of a CT scan. MRI, however, is not as sensitive as CT for detecting subarachnoid blood. 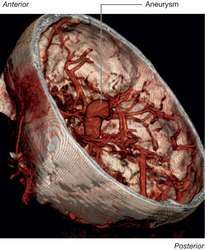 A CT scan can determine whether there has been a hemorrhage and can assist in pinpointing the location of the aneurysm. The scan is most useful when it is done within 72 hours of the rupture. Later scans may miss the signs of hemorrhage. If the CT scan is negative for a hemorrhage or provides an unclear diagnosis, the doctor will order a cerebrospinal fluid (CSF) analysis, also called a lumbar puncture. In this procedure, a small amount of cerebrospinal fluid is removed from the lower back and examined for traces of blood and blood-breakdown products. If this test is positive, cerebral angiography is used to map the brain's blood vessels and the damaged area. The angiography is done to pinpoint the aneurysm's location. About 15% of people who experience SAH have more than one aneurysm. For this reason, angiography should include both the common carotid artery that feeds the front of the brain and the vertebral artery that feeds the base of the brain. Occasionally, the angiography fails to find the aneurysm and must be repeated. If seizures occur, electroencephalography (EEG) may be used to measure the electrical activity of the brain. If an aneurysm has not ruptured and is not causing any symptoms, it may be left untreated. Because there is a 1-2% chance of rupture per year, the cumulative risk over a number of years may justify surgical treatment. However, if the aneurysm is small or in a place that would be difficult to reach, or if the person who has the aneurysm is in poor health, the surgical treatment may be a greater risk than the aneurysm. Risk of rupture is higher for people who have more than one aneurysm. Unruptured aneurysm would probably be treated with a surgical procedure called the clip ligation, as described below. The primary treatment for a ruptured aneurysm involves stabilizing the victim's condition, treating the immediate symptoms, and promptly assessing further treatment options, especially surgical procedures. The patient may require mechanical ventilation, oxygen, and fluids. Medications may be given to prevent major secondary complications such as seizures, rebleeding, and vasospasm (narrowing of the affected blood vessel). Vasospasm decreases blood flow to the brain and causes the death of nerve cells. A drug such as nimodipine (Nimotop) may help prevent vasospasm by relaxing the smooth muscle tissue of the arteries. Even with treatment, however, vasospasm may cause stroke or death. To prevent further hemorrhage from the aneurysm, it must be removed from circulation. In general, surgical procedures should be performed as soon as possible to prevent rebleeding. The chances that aneurysm will rebleed are greatest in the first 24 hours, and vasospasm usually does not occur until 72 hours or more after rupture. If the patient is in poor condition or if there is vasospasm or other complication, surgical procedures may be delayed. The preferred surgical method is a clip ligation in which a clip is placed around the base of the aneurysm to block it off from circulation. Surgical coating, wrapping, or trapping of the aneurysm may also be performed. These procedures do not completely remove the aneurysm from circulation, however, and there is some risk that it may rebleed in the future. Newer techniques that look promising include balloon embolization, a procedure that blocks the aneurysm with an inflatable membrane introduced by means of a catheter inserted through the artery. An unruptured aneurysm may not cause any symptoms over an entire lifetime. Surgical clip ligation will ensure that it won't rupture, but it may be better to leave the aneurysm alone in some cases. Familial cerebral aneurysms may rupture earlier than those without a genetic link. Congenital — Existing at birth. Ehlers-Danlos syndrome — A rare inheritable disease of the connective tissue marked by very elastic skin, very loose joints, and very fragile body tissue. Embolization — A technique to stop or prevent hemorrhage by introducing a foreign mass, such as an air-filled membrane (balloon), into a blood vessel to block the flow of blood. Fibromuscular dysplasia — A disorder that causes unexplained narrowing of arteries and high blood pressure. Magnetic resonance angiography — A noninvasive diagnostic technique that uses radio waves to map the internal anatomy of the blood vessels. Marfan syndrome — An inheritable disorder that affects the skeleton, joints, and blood vessels. Major indicators are excessively long arms and legs, lax joints, and vascular defects. Nimodipine (Nimotop) — A calcium-channel blocker, that is, a drug that relaxes arterial smooth muscle by slowing the movement of calcium across cell walls. Polycystic kidney disease — An abnormal condition in which the kidneys are enlarged and contain many cysts. Pseudoxanthoma elasticum — A hereditary disorder of the connective, or elastic, tissue marked by premature aging and breakdown of the skin and degeneration of the arteries that leads to hemorrhages. Subarachnoid hemorrhage (SAH) — Loss of blood into the subarachnoid space, the fluid-filled area that surrounds the brain tissue. Vasospasm — Narrowing of a blood vessel caused by a spasm of the smooth muscle of the vessel wall. The outlook is not as good for a person who suffers a ruptured aneurysm. Fifteen to twenty-five percent of people who experience a ruptured aneurysm do not survive. An additional 25-50% die as a result of complications associated with the hemorrhage. Of the survivors, 15-50% suffer permanent brain damage and disability. These conditions are caused by the death of nerve cells. Nerve cells can be destroyed by the hemorrhage itself or by complications from the hemorrhage, such as vasospasm or hydrocephalus. Hydrocephalus, a dilatation (expansion) of the fluid-filled cavity surrounding the brain, occurs in about 15% of cases. Immediate medical treatment is vital to prevent further complications and brain damage in those who survive the initial rupture. Patients who survive SAH and aneurysm clipping are unlikely to die from events related to SAH. There are no known methods to prevent an aneurysm from forming. If an aneurysm is discovered before it ruptures, it may be surgically removed. CT or MRI angiography may be recommended for relatives of patients with familial cerebral aneurysms. Brain Aneurysm Foundation, Inc. 66 Canal St., Boston, MA 02114. (617) 723-3870. http://neurosurgery.mgh.harvard.edu/baf. Bernadini, Gary L. "Intracerebral Aneurysms." Columbia University Health Sciences Page. http://cpmcnet.columbia.edu. "The Brain Aneurysm Report." Neurosurgical Service Page. Harvard Medical School. http://neurosurgery.mgh.harvard.edu/abta/primer.htm. an abnormal, localized dilation of a cerebral artery. It is most commonly the result of congenital weakness of the tunica media or muscle layer of the arterial wall. Cerebral aneurysms may also be caused by infection, such as occurs in subacute bacterial endocarditis or syphilis, and by neoplasms, arteriosclerosis, and trauma. The most frequent sites are the middle cerebral, internal carotid, basilar, and anterior cerebral arteries, especially at bifurcations of vessels. Cerebral aneurysms may occur in infancy or old age. They may be fusiform dilations of the entire circumference of an artery or saccular outcroppings of the side of a vessel. The outcroppings may be as small as a pinhead or as large as an orange but are usually the size of a pea. Cerebral aneurysms pose a danger of rupture and intracranial hemorrhage. A dilated and weak segment of a cerebral artery, often located in the circle of Willis at the base of the brain, which is susceptible to rupture; cerebral aneurysms may be birth defects or follow poorly controlled hypertension. “Thunderclap headache” often associated with nausea, vomiting and reduced consciousness. Brain aneurysm Neurology A dilated and weakened, rupture-prone segment of a cerebral artery, which may be a birth defect or develop 2º to poorly controlled HTN; ±5% of general population has an aneurysm; rupture occurs in 4/105/yr Clinical-rupture Severe 'thunderclap' headache, weakness, numbness, N&V, neurologic defects, ↓ consciousness. See Aneurysm. Local widening or bulging in an artery in the brain. Cerebral aneurysm is an outpouching of the wall of a cerebral artery that results from weakening of the wall of the vessel. It is difficult to determine the frequency of cerebral aneurysms because of differences in the definitions of the size of aneurysm and the ways that aneurysms are detected. The prevalence is estimated to range from 5% to 10%; unruptured aneurysms account for approximately 50% of all aneurysms. Cerebral aneurysms have a variety of sizes, shapes, and causes (Table 1). Most cerebral aneurysms are sacular or berrylike with a stem and a neck. The incidence of cerebral aneurysm has been estimated at 12 cases per 100,000 individuals, with approximately 15% to 25% of patients having multiple aneurysms, often bilaterally in the same location on both sides of the head. Clinical concern arises if an aneurysm ruptures or becomes large enough to exert pressure on surrounding structures. When the vessel wall becomes so thin that it can no longer withstand the surrounding arterial pressure, the cerebral aneurysm ruptures, causing direct hemorrhaging of arterial blood into the subarachnoid space (subarachnoid hemorrhage). Complications of a ruptured cerebral aneurysm can be fatal if bleeding is excessive. Subarachnoid hemorrhage can lead to cerebral vasospasm, cerebral infarction, and death. Rebleeding often occurs in the first 48 hours after the initial bleed but can occur any time within the first 6 months. Other complications include meningeal irritation and hydrocephalus. Possible causes are congenital structural defects in the inner muscular or elastic layer of the vessel wall; incomplete involution of embryonic vessels; and secondary factors such as arterial hypertension, atherosclerotic changes, hemodynamic disturbances, and polycystic disease. Cerebral aneurysms also may be caused by shearing forces during traumatic head injuries. Several different genetic loci have been associated with an increased susceptibility to cerebral aneurysm, but specific genes have not yet been implicated. Some researchers have identified 19 single nucleotide polymorphisms (SNPs) on chromosome 9, chromosome 8, and chromosome 4. There are no phenotypic differences between familial and sporadic forms. In one study of familial inheritance patterns, the autosomal recessive pattern was seen in slightly more than half of the population and autosomal dominance was seen in just over one-third, with about 5% showing incomplete penetrance. The autosomal dominantly transmitted disorder polycystic kidney disease has been associated with an increased incidence of intracerebral aneurysm. The peak incidence of cerebral aneurysm occurs between ages 35 and 60. Women in their late 40s through mid-50s are affected slightly more than men. The prognosis of subarachnoid hemorrhage resulting from an aneurysm is worse for women than for men. Cerebral aneurysms rarely occur in children and adolescents, but when they occur, they are often larger than those found in adults; pediatric aneurysms account for approximately 2% of all cerebral aneurysms. The odds of African Americans having a cerebral aneurysm are approximately twice that of whites. The prognosis of aneurysmal subarachnoid hemorrhage is worse for women than for men. The estimated frequency of cerebral aneurysm globally is approximately 10 (a range of 4 to 20) per 100,000 individuals, but it is dependent on location. The highest rates are reported in Japan, China, Sweden, and Finland. Prior to rupture, cerebral aneurysms are usually asymptomatic. The patient is usually seen initially after subarachnoid hemorrhage (SAH). Ask about one or more incidences of sudden headache with vomiting in the weeks preceding a major SAH. Other relevant symptoms are a stiff neck, back or leg pain, or photophobia, as well as hearing noises or throbbing (bruits) in the head. “Warning leaks” of the aneurysm, in which small amounts of blood ooze from the aneurysm into the subarachnoid space, can cause such symptoms. These small warning leaks are rarely detected because the condition is not severe enough for the patient to seek medical attention. Identify risk factors such as familial predisposition, hypertension, cigarette smoking, or use of over-the-counter medications (e.g., nasal sprays or antihistamines) that have vasoconstrictive properties. Ask about the patient’s occupation, because if the patient’s job involves strenuous activity, there may be a significant delay in going back to work or the need to change occupations entirely. Common symptoms include headache, facial pain, alterations in consciousness, and seizures. In most patients, the neurological examination does not point to the exact site of the aneurysm, but in many instances, it can provide clues to the localization. Signs and symptoms can be divided into two phases: those presenting before rupture or bleeding and those presenting after rupture or bleeding. In the phase before rupture or bleeding, observe for oculomotor nerve (cranial nerve III) palsy—dilated pupils (loss of light reflex), possible drooping eyelids (ptosis), extraocular movement deficits with possible double vision—as well as pain above and behind the eye, localized headache, or extraocular movement deficits of the trochlear (IV) or abducens (VI) cranial nerves. Small, intermittent, aneurysmal leakage of blood may result in generalized headache, neck pain, upper back pain, nausea, and vomiting. Note if the patient appears confused or drowsy. The patient has to cope not only with an unexpected, sudden illness but also with the fear that the aneurysm may rupture at any time. Assess the patient’s ability to cope with a sudden illness and the change in roles that a sudden illness demands. In addition, assess the patient’s degree of anxiety about the illness and potential complications. Other Tests: Noninvasive angiographic methods (computed tomographic angiography and magnetic resonance angiography) allow for detection of aneurysms; postprocessing techniques allow for three-dimensional evaluation of the aneurysm; lumbar puncture (for patients not at risk for increased intracranial pressure [ICP]), skull x-rays, electroencephalography, transcranial Doppler ultrasonography, single-photon emission computed tomography, positron emission tomography, xenon-CT, cervical spine imaging. The first priority is to evaluate and support airway, breathing, and circulation. For patients unable to maintain these functions independently, assist with endotracheal intubation, ventilation, and oxygenation, as prescribed. Monitor neurological status carefully every hour and immediately notify the physician of any changes in the patient’s condition. Microsurgery is indicated to prevent rupture or rebleeding of the cerebral artery. The decision to operate depends on the clinical status of the patient, including the level of consciousness and severity of neurological dysfunction, the accessibility of the aneurysm to surgical intervention, and the presence of vasospasm. Surgical procedures used to treat cerebral aneurysms include direct clipping or ligation of the neck of the aneurysm to enable circulation to bypass the pathology. Endovascular coiling of cerebral aneurysms may also be used in some situations, particularly in aneurysms with a small neck size (< 4 mm), a luminal diameter < 25 mm, and those that are distinct from the parent vessel. An inoperable cerebral aneurysm may be reinforced by applying to the aneurysmal sac such materials as acrylic resins or other plastics. Postoperatively, monitor the patient closely for signs and symptoms of increasing ICP or bleeding, such as headache, unequal pupils or pupil enlargement, onset or worsening of sensory or motor deficits, or speech alterations. Other Drugs: Antihypertensives may be prescribed for patients with high blood pressure. Antiepileptics are administered for treatment and prevention of seizures. Sedatives may be prescribed to promote rest and relaxation, and aminocaproic acid, a fibrinolytic inhibitor, may be given to minimize the risk of rebleeding by delaying blood clot lysis. The patient may receive colloids such as albumin or plasmanate to decrease blood viscosity and expand the intravascular volume. The environment should be as quiet as possible, with minimal physiological and psychological stress. Maintain the patient on bedrest. Limit visitors to immediate family and significant others. Apply thigh-high elastic stockings and intermittent external compression boots. Discourage and control any measure that initiates Valsalva’s maneuver, such as coughing, straining at stool, pushing up in bed with the elbows, and turning with the mouth closed. Assist with hygienic care as necessary. If the patient has a facial weakness, assist her or him during meals. Preoperatively, provide teaching and emotional support for the patient and family. Position the patient to maintain a patent airway by elevating the head of the bed 30 to 45 degrees to promote pulmonary drainage and limit upper airway obstruction. Suction the patient’s mouth and, if needed, the nasopharynx and trachea. Before suctioning, oxygenate the patient well, and to minimize ICP increases, limit suctioning to 20 to 30 seconds at a time. If the patient has facial nerve palsy, apply artificial tears to both eyes. Take appropriate measures to prevent skin breakdown from immobility. Postoperatively, promote venous drainage by elevating the head of the bed 20 to 30 degrees. Emotional support of the patient and family is also important. The patient may be dealing with a neurological deficit, such as paralysis on one side of the body or loss of speech. If the patient cannot speak, establish a simple means of communication such as using a slate to write messages or using cards. Encourage the patient to verbalize fears of dependency and of becoming a burden. Fargen, K.M., Rahman, M., Neal, D., & Hoh, B.L. (2013). Prevalence of patient safety indicators and hospital-acquired conditions in those treated for unruptured cerebral aneurysms: Establishing standard performance measures using the Nationwide Inpatient Sample database. Journal of Neurosurgery, 119(4), 966–973. A national review was conducted among patients with cerebral aneurysm to determine their rates of patient safety indicators (PSIs), including postoperative respiratory failure, deep vein thrombosis, sepsis, and postoperative hemorrhage, as well as hospital-acquired conditions (HACs), including falls resulting in intracranial injury, fracture, or other trauma injury. Among 54,589 separate admissions of patients diagnosed with an unruptured cerebral aneurysm, 66% of patients did not receive any treatment for their aneurysm during hospitalization, 18.2% underwent endovascular coiling, 15.2% underwent surgical clipping, and 0.6% underwent both coiling and clipping. Investigators estimated a national rate of 170 PSIs (95% CI, 162 to 178) and a rate of 10.6 HACs (95% CI, 8.6 to 13.1) for every 1,000 patients with a clipped unruptured aneurysm. Among patients who received endovascular coiling, investigators estimated a national rate of 127 PSIs (95% CI, 120 to 133) and a rate of 10.7 HACs (95% CI, 8.8 to 12.3) for every 1,000 patients. In patients who received treatment for their aneurysm, developing one or more PSIs during hospitalization increased the length of stay by more than 11 days (p < 0.0001) when compared to treated patients without any PSIs during hospitalization. Prepare the patient and family for the possible need for rehabilitation after the acute care phase of hospitalization. Instruct the patient to report any deterioration in neurological status to the physician. Stress the importance of follow-up visits with the physicians. Be sure the patient understands all medications, including dosage, route, action and adverse effects, and the need for routine laboratory monitoring if anticonvulsants have been prescribed. Eventually, after being referred to a more senior doctor and having a CT scan, she was diagnosed as having had a brain aneurism. In writing this column, the master of the genre was forefront in my mind: Chicago Tribune columnist Mike Royko who died at age 64 Tuesday of a brain aneurism. FDA to market its optical fiber/coil delivery device with a small diode laser, a little larger than a telephone, for treating brain aneurisms.